Spaghetti Aglio E Olio, meaning spaghetti with garlic and oil. Classic traditional Italian recipe to have and one of my all time favorite to settle for a quick meal. I have tried this umpteen times in many different variations. And of all my attempts, I am most satisfied with this latest recipe where I use the combination of chorizo with prawns. Do not be hesitant with your garlic, especially if you are a garlic lover. The main success factor of this recipe is to get as much flavor of the garlic into the oil as possible. Remove the browned garlic flakes from the oil once you are done infusing. Add it back in only when your spaghetti's almost done. In this recipe, I use Tiger Prawns. After cleaning the prawns, reserve the shells and use it to make concentrated stock with white wine. Further rendering fats out of chorizo together with the infused garlic oil, add the stock in and finish up with the spaghetti. This totally bring a new spark of life to this classic Italian recipe. Side note: If you are just cooking the classic recipe, Chorizo and Prawns are optional. The fundamental steps are still the same. First, prepare the concentrated prawn stock. Sauteed the prawn shells and heads with a tad bit of olive oil until it turn red and fragrant. Add in white wine and let boil with the shells for a minute or two. Reduce heat and simmer for at least 15 to 20 minutes. Until stock is reduced by half to 2/3. Sieve the shells and reserve the stock for usage later. Get your pot of water to boil and ready your pasta for cooking. (Pasta cooking time varies, do gauge the timing while preparing your oil and other ingredients.) Prepare pan and sauteed your garlic flakes on medium low heat. Remove your garlic flakes when its almost brown and fragrant. Next, sauteed the prawns in the pan with the infused oil till about 70% cooked through. Then remove from pan and set aside. Add in chopped chilli and chorizo and sauteed for a few minutes with the infused oil. Remove the pasta from the boiling water when its a minute to Al Dente. Add the spaghetti into the pan with the ingredients mixture on medium low heat. Prawns and parsley in, salt and pepper to taste. Toss and mix the spaghetti with the ingredients until Al Dente. Serve and top with grated parmigiano reggiano. 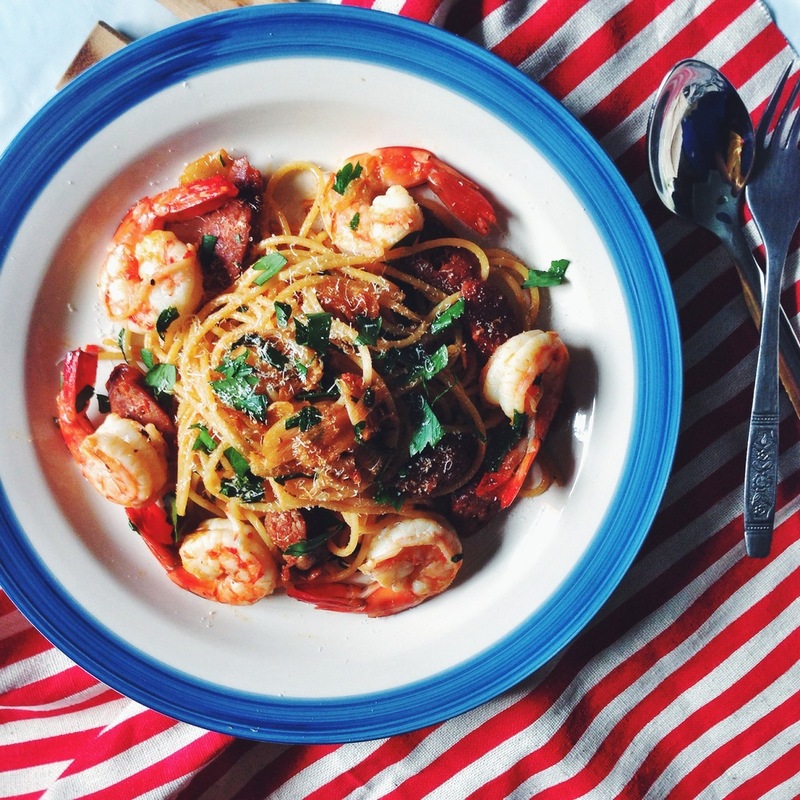 Your Aglio E Olio should be full of garlic fragrant bursting with the flavors of the chorizo and prawns. You can add in other combination of ingredients like squid, clams etc. Create your own variation or just a simple aglio e olio will be more than enough to satisfy your taste buds with this recipe!